This time of year there are so many reasons to get together and enjoy snacks! Whether it it professional sports on TV, days off of school, or just recovery from the rich formal meals of the holidays. We crave the sweet, salty, and crunchy satisfaction of a good snack. There are options and we thought it worthwhile to visit an easy alternative. You can avoid all the unnatural snacks without sacrificing the flavor by making your own potato-chip-alternative for your cravings. 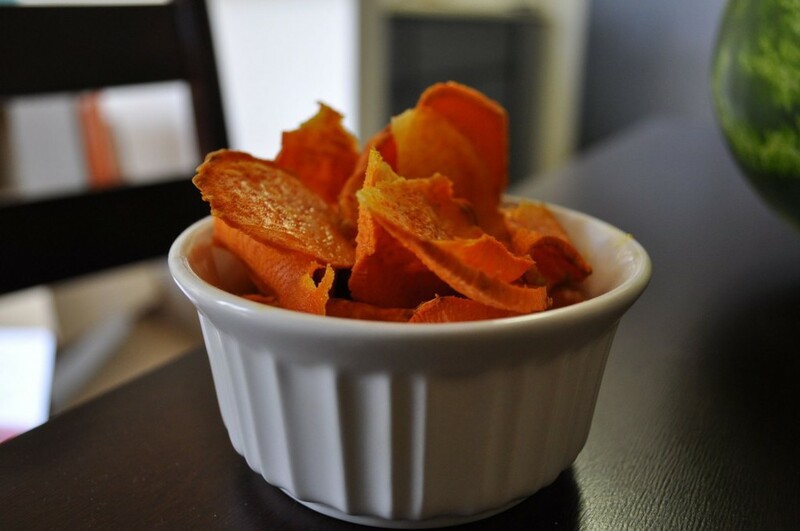 These homemade sweet potato chips are much healthier and easy to make from home, no frier required. All you need is: 1 sweet potato, 1 Tbsp of coconut oil, salt, and any spices you like. Double or triple the recipe if you like. Wash your potato and peel it. This works best with an actual peeler, but a knife will work to if you don't have one. Cut the potato into very thin slices. Place the thin slices spread out on a cookie sheet and brush with coconut oil. Sprinkle with salt to desired taste. Bake in a 450 Degree oven for 22 to 25 minutes. You can experiment with lower temperatures and longer times to get them just the way you like them. However, all ovens are different so check yours often.